Using shirataki instead of rice noodles and adding in fiber-rich zucchini makes this Asian-inspired dish both light and satisfying, while the almond butter sauce adds a savory kick you'll love. Best prepared within two days of delivery. Shred tofu using a cheese grater. Cut zucchini and carrots into matchsticks. Mince the green onion. Tear up the basil. 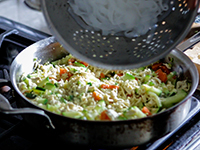 Put the shirataki noodles in a strainer and rinse well with warm water. Roughly chop almonds. Crush the garlic with a garlic press (or mince it). 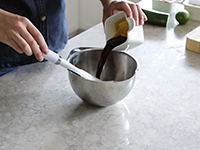 Whisk together minced garlic, almond butter, soy sauce, and ½ cup of boiling water in a bowl until smooth. If the sauce is too thick, add more boiling water to thin it out. Heat 1 tbsp of cooking oil in a large frying pan over medium heat. 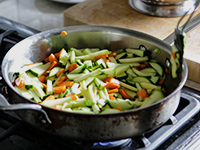 Add the carrots and zucchini and cook, stirring with a spatula, until softened, about 5 minutes. Add the tofu and ½ the green onions and cook, stirring, for another 5 minutes. Add the noodles and stir to mix in with the vegetables. Once everything is combined, add in the sauce and basil and stir to combine. Cook for another 5 minutes until hot. Serve the Pad Thai onto four dishes and top with chopped almonds and the remainder of the green onion. Serve with lime wedges.